careful sorter on the market! Together the AM-Vision and the AM-sorter form the ultimate high speed, gentle handling sorting station. In combination with the AM-Vision, the AM sorter forms a complete sorting station. With it’s origins in the sorting of bakery and confectionary goods, this affordable, small item sorter is developed by our partner Invata. The AM-Vision provides the recognition, the AM-Sorter ensures that the identified objects go to the correct next process step. 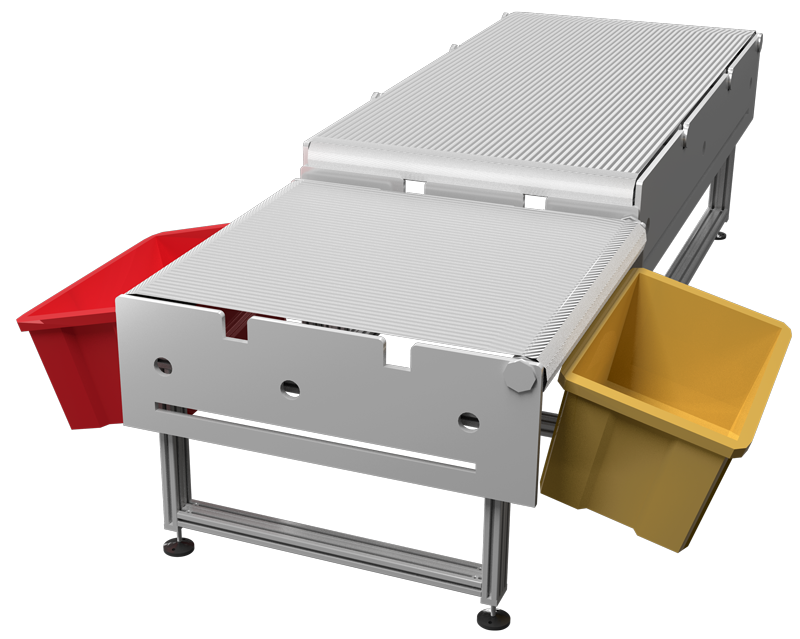 The AM-Sort conveyor is custom built for you. The design is modular, easily expandable and pre-wired. Items are discharged to either side of the Small Item Sorter conveyor at right-angles, enabling a optimal use of sortation space. Depending on the amount of finishing steps you have in your factory, you define the amount of sorting docks. The setup consists of cross-oriented, retractable conveyor belts. This allows a large amount of products to be sorted quickly (3,600 items per hour) and treated gently at the same time. Ideal for the careful handling of 3D-printed products, with a large form differentiation and often fragile structure. The AM-Sort occupies only a small amount of space. It’s safe, low noise, has efficient 24-volt motor driven rollers requiring no lubrication. The AM-Sort solution is available in a Pay-per-Part model. This way you can access the great benefits of the AM-Sort, with minimum investment upfront. The AM-Sort solution is available in a lease model. The lease model provides you a hybrid solution for your factory of the future. The AM-Sort solution is available to buy. This model provides you full ownership of the solution for your factory of the future.